Could this be the device to finally kill off the feature phone? The Alcatel One Touch Fire is a tricky one to call: it's not meant for the markets that we are most used to. It's an excellent starting point for anyone who's looking to enter the world of smartphones and could well succeed in the emerging markets it wishes to dominate. 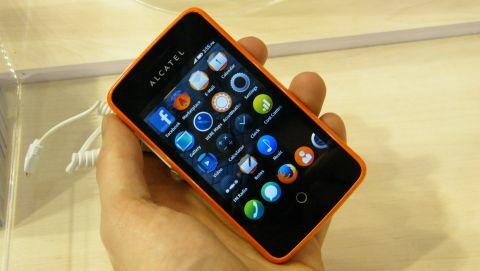 The Alcatel One Touch Fire isn't your ordinary low-end handset, oh no this one comes running the new, purely HTML 5-based Firefox OS from those web browser guys over at Mozilla. Announced alongside the ZTE Open, both handsets are destined for emerging markets including Latin America and Eastern Europe, as well as Spain, with the aim of ridding the world of feature phones. If you're lucky enough to be residing in one of the regions that will be first to experience Firefox OS, you can expect the One Touch Fire to arrive this summer, sporting a sub-US$100 (£65/AU$100) price tag. It's unlikely that the One Touch Fire will ever make it to the more developed regions such as the UK, US and Australia but if the Firefox OS platform picks up we could well see it feature on more powerful handsets in the future. With the low cost and feature phone replacement in mind, the Alcatel One Touch Fire was always going to be a low-end handset with basic features, so don't go expecting the world from this phone. It comes in two colours - white with a blue frame or a pure orange that matches the brightly coloured creature on the Firefox logo. The orange is certainly eye catching, and will help the One Touch Fire stand out from the swath of black feature phones currently available, which may convince some consumers to give it a spin in the store. Unsurprisingly the One Touch Fire is clad in some heavy duty plastic, but its diminutive size and solid build means it sits nicely in the hand and it feels like it could take a few knocks. The power/lock key on top and volume rocker switch on the side are easy to hit even with one handed use, while below the 3.5-inch display sits a centralised touch button that acts as the home key. Although it's not obvious, Firefox OS is completely HTML 5-based, and all the apps you see on the phone are actually web pages but work as you'd expect a standard app to. While Firefox OS will feel pretty restrictive to those used to Android and iOS phones, it will certainly speak to feature phone users and provides a gentle step into the world of smartphones without any over complicated information. The One Touch Fire sports a 1GHz single-core processor and 256MB of RAM, which gives a slightly slower user experience as the handset leisurely skips between pages of apps and takes a few seconds to launch them. Once again, though, you need to remember the people who will be using this handset will be stepping up from a feature phone that will more than likely be even slower, so the One Touch Fire could well be a breath of fresh air. The software is still very much in development, so the One Touch Fire we were using did fall over every now and then, but those issues should be ironed out before it hits the market. The viewing experience isn't particularly stellar, since the low resolution display makes everything on the screen noticeably pixelated, but it was responsive to our touch. That said, websites still looked pretty good on the One Touch Fire, and the Firefox web browser did a decent job of loading the desktop version of TechRadar over a rather flaky Wi-Fi network. Images don't pop in the same way, nor does text look as defined, but we found the One Touch Fire offered up a more than acceptable surfing experience. To exit an application you need to hit the home button below the screen, while going back within an app is done via a small back button located in the top-left of the screen. We found the button to be a tad on the small size, and we'd like to see it double in width to make it that bit easier to hit - especially when holding the One Touch Fire in your right hand. There's a pitiful amount of internal storage here, with the One Touch Fire offering up just 180MB, but a microSD card slot hidden under the rear cover means you can expand this by up to 32GB if you want to fill it with music and photos. Another slight issue we had with the OS was the icon for the camera app, which looks a bit like a picture of a CD. At first we though it was the music player app, until we saw the icon sporting a musical note in the app list. In terms of a camera, the One Touch Fire comes with a 3.2MP rear-facing lens, but there's no flash and no front-facing option. The camera app is very basic, providing you with point and shoot controls, and the shutter takes a few seconds to snap the picture and return you to shooting mode. Picture quality - as you may expect - isn't great, but it's still good enough to upload to social networks, with the likes of Facebook and Twitter pre-installed on the Alcatel One Touch Fire. The keyboard on Firefox OS is another basic offering, and thanks to the 3.2-inch display on the One Touch Fire it's a little cramped. We found we were hitting quite a few wrong keys as we tapped out a message. Powering the show is a 1,400mAh battery, which should last a decent amount of time given the modest internal components and low resolution display on the Alcatel One Touch Fire, but we were unable to say for sure during the short time we had with the phone. The Alcatel One Touch Fire is a tricky one to call, since it's not meant for the markets that we are most used to. In terms of a suitable replacement for the feature phone, it looks to be an excellent starting point for anyone who's looking to enter the world of smartphones. And if marketed correctly and given enough support from the industry (support that has already been strong) it could well succeed in the emerging markets it wishes to dominate.